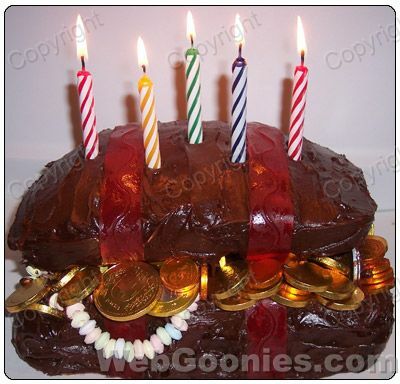 WebGoonies.com - Happy Birthday Daddy! Written on February 27, 2006 by Rylan & Kaitlyn. My mom let me stay up late tonight to report that my dad turned 25 years old today. Wow, that's really old. Mommy spent a lot of time making a great cake and I even got to help as well. I watched my mom as she baked it and she taught me how to make a cake. I was really excited to learn how to make a cake. The cake plays along with the pirate party theme that my mom wanted for my dad. He is the head captain after all. I wonder if those gold piece are worth anything. I definitely think that mom did a great job. Now its time for me to head off to bed so tomorrow we can open gifts. When is it my turn to get gifts? Yarr Invited sounds great to me. Take a look at some of these websites that my wife hunted down, they each have some pretty nice stuff. To Kevin: Happy Birthday! That cake looks pretty cool! HAPPY ARRG BIRTHDAY TO YOU..
Jared: I agree with Kevin & Julie yarr invited sounds the best. I just wish Rylan could taste the cake her helped make. I know they aren't supposed to have chocolate until they are 2, but not even just a little taste of his daddy's cake? Rylan won't be tasting the chocolate cake this year but I would certainly think he can next year. He did get a treat (or not a treat depening on how you look at it) though, we got the OK to start feeding him rice cereal so we took our first attempt at it last night. More information on a future post..
No chocolate until two? Bah. There's a chocolate birthday cake clause. Kevin, my mother bought my son and me pirate hats from Dead Men Tell No Tales, for Christmas. Ian had a minor fascination with pirates last spring (thank you, Mr. Krabs! ), but it blossomed into obsession last summer during our vacation in Florida. There we were, floating in the warm waters of the Gulf, when we saw this on the horizon. Yarrrgh! Alas and alack, we missed National Talk Like a Pirate Day.